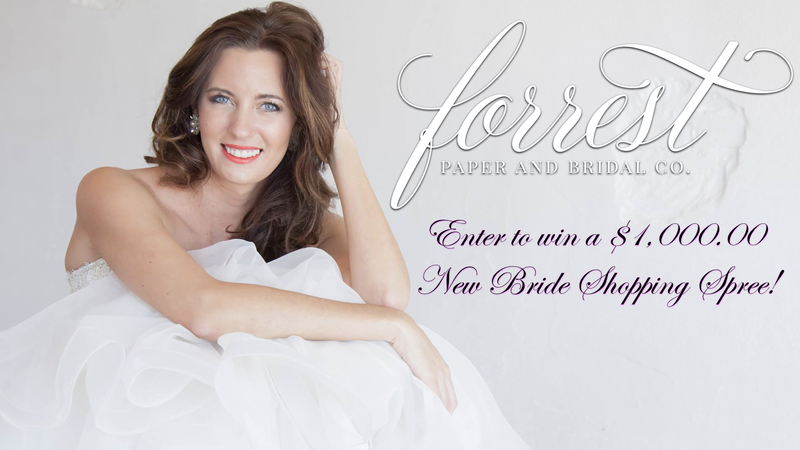 Forrest Paper & Bridal - Enter to Win a $1,000 New Bride Shopping Spree! Forrest Paper & Bridal Co. is giving one lucky new bride a $1,000.00 shopping spree good for goods and services from Forrest Paper & Bridal. Fill out the form below to enter. Every bride who enters will receive a voucher good for 50 Handcrafted Thankyou cards, 1 free 20-minute New Bride Consultation and our wedding checklist. *Future brides only, please do not register brides you know without consent. By entering, you authorize Forrest Paper & Bridal to communicate with your digitally.